Nokia vs. Apple: Don’t Count Nokia Out Yet! Agreeably, it is unfair (and risky) to compare two stocks with a disparity as huge as $564 Billion between their market caps, but I’m taking my chances today. A photo (shown below) that appeared on my Facebook (NASDAQ:FB) newsfeed a few days ago had me thinking. While I’m sure many may have already seen it, I thought to share it with the rest, adding some of my own thoughts to it. The photo compares Nokia’s (NYSE:NOK) top smartphone Lumia 900 with Apple’s (NASDAQ:AAPL) iPhone 4s. According to it, Lumia 900 costs you $200 less than an iPhone 4s (phone prices in the photo are two months old—Nokia recently slashed Lumia 900’s price by 50%) but interestingly enough, it costs Nokia 9% more to make a Lumia 900 than it costs Apple to make an iPhone 4s. Nokia employs a more expensive processor coupled with a more expensive wireless chip and touchscreen. Lumia 900 also runs on 4G LTE networks–an iPhone doesn’t. That makes Lumia 900 a much faster yet cheaper phone than the iPhone 4s, still Nokia reported a loss in its recent earnings annoucement. Again! While, Apple’s success story continues. So far, I haven’t presented my thoughts. Before I begin, let’s establish one thing that I’m not here to bash one company or the other. This isn’t about Team Nokia vs. Team Apple. Apple has a great growth potential looking forward and there’s no questioning that. It has created its brand image and has its own target market of loyal customers who are willing and able to pay the price. This is exactly where we get Apple’s secret recipe of success from. Target those who have the ‘willingness’ and more importantly ‘ability’ to pay for your expensive products—in Apple’s case, the rich! Apple is not for the poor. Go outside of the US and it’s not even for the middle income earners. An iPhone becomes affordable to a middle income earner in the US when bought through a telecom operator on a contract basis. But internationally, not all telecom networks offer subsidized phones. So what exactly is this niche marketing thing that Apple employs? Niche marketing is basically selling to a target market where consumers have a lower elasticity of demand—in other words where they are ready to pay higher prices. Generally (not exclusively in the US), it is the upper-middle and the upper class of the society that can afford Apple products. For this article only, let’s keep our focus on the mobile segment of each company. Apple makes only one phone, the iPhone, and markets one model at a time. Months later it comes out with a newer version of it. The customers, who develop brand loyalty, are both ‘willing’ and ‘able’ to replace the older version with the new one and in most cases they do. Using an iPhone becomes all the more fun when your friends have one too. Apple boosts revenues while adding more to its customer base each quarter. Simple chain mechanism. 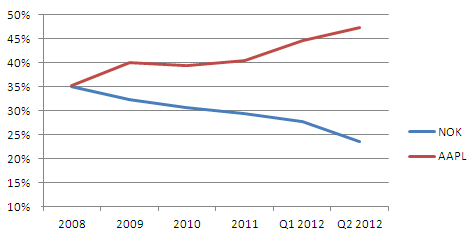 Historically, both Nokia and Apple started off with the same profit margins above their costs of sales in 2008. Over the years Apple increased its margins while Nokia’s decreased. So what exactly is the problem with Nokia? Nokia has its legs in two boats. In an effort to be the jack of all trades, it has left the shareholders unhappy by mastering none. Apple generated 58% of its revenues from ONE SINGLE product with the biggest consumer market in the Americas. Their competitive advantage is their iOS-run smartphone made for the richer niche segment of the cell phones market. Nokia, on the other hand, seems confused as to what it is doing. Here’s my advice to them. For starters, Nokia needs to come to terms with the fact that it will be futile now to try taking back the market share that it has already lost to Apple and Samsung. Nokia will now have to explore a new niche or at least hold on to what little share is left with it–which basically is not little if you consider the worldwide market share. Apple is not a world leader. Google’s (NASDAQ:GOOG) android leads the smartphone market with Samsung as the top vendor. While, worldwide market leader of mobile phones is none other than Nokia itself. Next, Nokia needs to take its focus off of the Americas and instead focus on Asian, African and Middle Eastern countries where the consumer purchasing power is much less. These countries generally can’t afford an iPhone but they do need phones. Nokia draws only 19% of its revenues from the Americas against Apple’s 34%. The rest of the 81% comes from its international operations where the South-East Asian countries can specifically be their niche market. Their average buyer is generally less tech savvy than an American or European buyer. After China and the US, the countries with the most mobile phone users are India and Pakistan. Their average per capita income is much less compared to America and China, but from a slum-dweller to the top executive, everybody owns a mobile phone (that too, mostly a Nokia). Nokia’s competitive advantage is clearly not smartphones. With all that heavy tech investment, it was able to sell only 10.2 million smartphones worldwide as opposed to Apple’s iPhone that sold 35.1 million units. On the contrary, the number of its mobile phones sold (73.5 million) is the highest amongst all vendors. 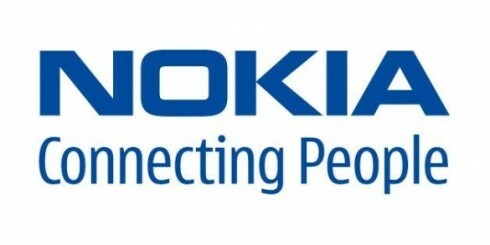 Nokia should bank on its mobile phone division than competing with biggies like Apple. The idea is to win from higher ‘sales volume’ than sales value. Apple wins from lower volume but higher prices. High input costs that go into making less profitable output (Lumia 900-like smartphones whose prices are later slashed) should be cut down. Purchasing in bulk or getting the suppliers into having bigger bidding wars, like Apple does, will help Nokia save on input costs. Nokia’s R&D expenses compared with the output sales are way too high. Apple’s latest quarter R&D expenses account for only 2% of sales, same as the previous quarter. Nokia’s R&D expenses are more than 15% of sales this quarter, up from last quarter’s 14.9%. In fact, the R&D expenses are so high compared to all other expenses that they’ve been returning negative operating profits (net losses) the past quarters. Why spend so much when you’re making little out of it! And cutting down R&D is not bad. It really isn’t if you, instead of constantly competing and losing against the wrong opponent, look for a different arena where you can win. This is what BlackBerry maker RIM (NASDAQ: RIMM) failed to understand. They came one on one with a behemoth. Had they focused on their unique target market of business elite that preferred security over game apps, further innovated the BB better suited to this market and stayed out of the smartphone line, they’d probably have still been around (they still are but it’s just about time). Nokia still has a potential to make a comeback. The tech industry is ever growing. The innovative possibilities in this industry are literally endless. Instead of getting punched in the sides every quarter, Nokia should pull itself together and exit the smartphone market. The company stands a better chance in the mobile phones market where it still is a leader. Yet, if it wishes to stay, it should at least cut down on fruitless expenses.